Its claw form snaps together without heavy tools, yet when filled with concrete, they’re made to last 100 years, even in high-rise buildings. The Dincel Construction System can reinforce elevator shafts, stairwells, basement walls, storage tanks or retaining walls. A state-of-the-art factory in Sydney, Australia, makes it by using an extrusion and on-line coring process for the profiles, which allows concrete infill to flow into the wall that’s built on-site. As a result, there’s no need for heavy metal stabilisers. The Dincel product displays VOC levels below detection, and toxicity level 3 times better than allowed by European standards. “It also has superior fire performance, better than plasterboard and fibre cement sheets,” says Dincel. The 200mm Dincel product has also undergone extensive testing at the University of Technology, Sydney (UTS). Conducted over two years, it showed Dincel can withstand an earthquake up to a magnitude 9 on the Richter scale. 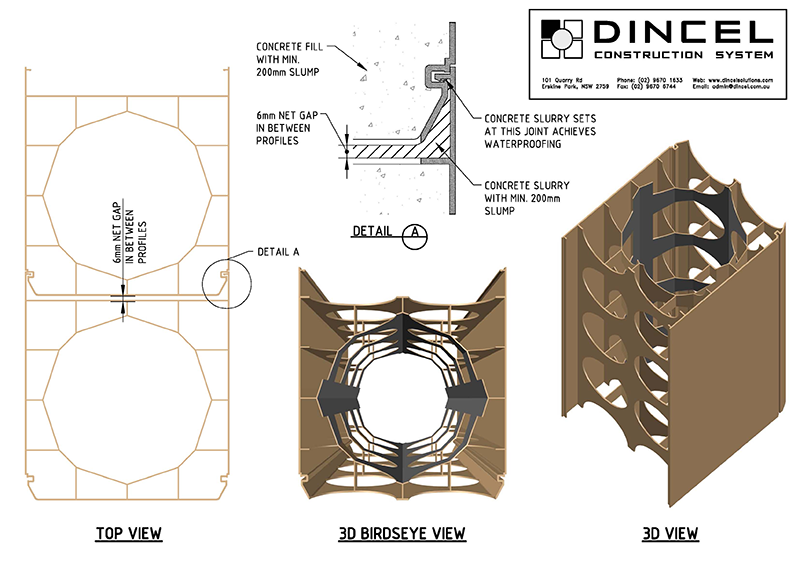 And 90% of Dincel Walls are fully recyclable – the concrete is crushed and reused, the steel which is unaffected by corrosive elements, and is reusable. The PVC itself can be recycled and used for various applications, such as a lightweight concrete aggregate.